Windows has something called Component Store and it consumes a lot of hard disk space. In some occasions, the component store can use anywhere from 4GB to 10GB to hard disk space within the C drive. As you can guess, when you clear component store, you can free up quite a bit of C drive space. Just follow the steps below and it will be over in a jiffy. For curious users, the Component Store is nothing but, in simple terms, the WinSxS folder that is located in C:\Windows folder. The component store was first introduced in Windows XP to better manage various parts and files of the Windows operating system. Usually, the files in the component store are responsible for customization and updating Windows. Windows manages the component store files by bundling them into packages. As the updates are available, some of these packages become obsolete. When that happens, Windows keeps them aside and deletes them as and when needed. If you want to learn more about the component store, read this detailed Microsoft document. Generally, Windows automatically triggers a pre-defined scheduled task to cleanup component store files. However, for whatever reason, Windows can sometimes miss the schedule to delete component store files. As a result, the component store occupies a lot of space uncessarily. In those situations, you can take things into your hands and delete component store files to free up C drive space. The good thing is, Microsoft provides the safest way to manage and delete component store files on Windows. Before proceeding, create a system restore point. Just to be on the safe side. Enter the below command to see if you actually need to clear component store. If "Component Store Cleanup Recommended" flag is set to "Yes", you need to clear component store cache. Proceed to the next step. Enter the below command to start the cleanup process. Depending on the component store size and the number of obsolete packages, it can take quite some time to complete the component store cleanup process. Sit back and wait till the process is complete. Don't turn off or interrupt the process. In my case, the component store cleanup freed up around 5GB of space. As you can tell, that is quite a lot of C drive space that can be utilized for other things. Keep in mind that you don't have to do this regularly. Windows takes care of the cleanup process for you, usually. 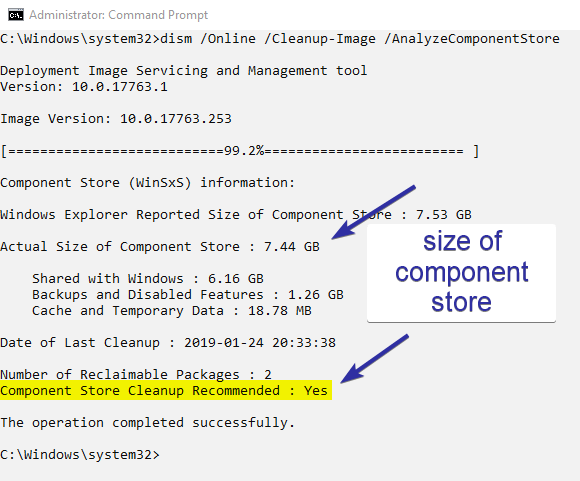 However, the component store is one of the places you should keep in mind if you are looking for various ways to free up space on Windows 10. That is all for now. If you like the article, do check out how to delete Windows bt and Windows ws folders, how to move downloads folder, and how to limit chrome cache to free some more space in your C drive.